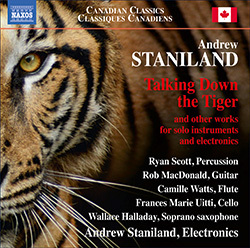 Andrew Staniland is a young Canadian composer of promise. His Talking Down the Tiger (Naxos 8.573428) presents five works for solo instrumentalists and electronics, the latter reinforcing and subtly adding to the live part in real time through recorded playback or alteration of the live sound. "Talking Down the Tiger" features quiet toms and mallets (played by Ryan Scott), extended and altered via looping. "Dreaded Sea Voyage" is for classical guitar (Rob MacDonald) and electronics, based on the recording on board the NASA reconnaissance space vehicle Voyager containing a sampling of "human music" in case the craft encounters other life forms in its travels through the universe. The guitar parts are altered versions of some of the music; the electronic part subtly adds to it. "Flute Vs. Tape" has a most vivacious flute part, played with a dynamic energy by Camille Watts. The tape part is composed of the second flute, acting contrapuntally. "Still Turning" is for cello (Frances Marie Uitti) and towards the end, a tape part that recalls themes from the other two works with which "Still Turning" forms a trilogy. In this, one of two movements that make thematic use of lines from T.S. Elliot's poem "Four Quartets," "Still Turning" captures via virtuoso cello the feeling of standing still while at the same time being in motion, for example if we stand motionless on earth as it travels rapidly in its orbit. The final work, "True North," for soprano saxophone (Wallace Halladay) and electronics, captures in sound the fact that magnetic north or even "true north" changes position slightly over time according to changes in the earth's axis and other factors. A circle of four microphones corresponding to the four compass points feed into four-fold, widely separate speaker playback which the performer controls through playing in proximity to each microphone at will. The music is basically tonal modern, with a bit of a harmonic-melodic edge, an attention to sound color and electronic enhancement, all of which subtly plays out on each piece. Staniland certainly has imaginative conceptual creativity that he realizes in each of the pieces. The music sounds eclectically contemporary and retains interest. The electronic part generally reinforces the live music without calling much attention to itself. This may not be the album of the year among new music releases, but it is not uninteresting! Jacques Ibert (1890-1962) is perhaps best known for his "Escales," but there is quite a bit more music from him, much of which does not get a great deal of performance these days. One might suppose that there were so many brilliant French composers competing for attention during his lifetime that Ibert has been unduly neglected as a result. 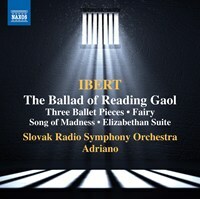 All that can be rectified in part by a new volume of some of his lesser-known orchestral-choral music, The Ballad of Reading Gaol (Naxos 8.555568) as respectably performed by the Slovak Radio Symphony Orchestra under Adriano. The title work, based on the poem by Oscar Wilde, was considered rather daring, having been first written as symphonic poem between 1920 and 1922, and performed soon after. Its deft handling of a bleak prison world and themes of the terror and anguish of an inmate who had murdered his wife were controversial at the time. As a first orchestral work it has touches of the influence of Debussy and Ravel but a well-crafted and dynamic originality as well. It was converted into a ballet and first performed in this vein at the Opera Comique in 1937. We find some worthwhile additional works on this anthology, namely Ibert's "Trois Pieces de Ballet" of 1921-22, a three-part concert suite from the ballet score, meant to depict various characters who frequented his mother's salons, the brief "Feerique" and "Chant de Folie," both from 1924, and the lengthier "Suite Elisabethaine" (1944), written with early music touches for incidental performance in Shakespeare's A Midsummer Night's Dream. You can readily hear progression and development in Ibert's impressionist/quasi-romantic stylistic approach in these chronologically presented works. They are all quite pleasing if perhaps not exactly world-class 20th century masterworks. They do add a good deal to understanding and appreciating Ibert, helping to flesh out a multi-dimensional portrait of the man and his music. It has its charms and will afford you a good bit of enjoyment, especially if you are of the Francophile contingency. It may not be particularly essential listening, but not everything can be that, after all. It pleases. By the time I became a bonafide, dedicated follower of new classical and avant garde music, that is in the early '70s, Lukas Foss (1922-2009) was at a peak in public recognition as one of the leading modern compositional voices in the USA. I am thankful for that because it gave me the chance to hear much of his work, as recordings of it were fairly plentiful and readily available. His notoriety faded somewhat in later years as did the popular attention to new music and subsequently too my undivided attention to it for a decade or so. Nonetheless I have found many of his works essential and my appreciation for his brilliance has gone undiminished. Looking back, I especially admire the "Time Cycle," which incorporated chamber improvisation, the "Baroque Variations" and its use of baroque musical sources to create an old-new amalgam, and his "GEOD" which nicely anticipated and offered a very personal solution to cyclical structures for a style that became in time known as minimalism. A proto post-modern poly-stylism characterized all of these works, for music that managed to be advanced yet highly appealing to most adventuresome ears. They and the majority of recorded works available then showed a composer acutely tuned to stylistic possibilities otherwise then mostly latent, and a vivid sense of drama and significant form, a personal originality and uniformly high level of craftsmanship and artistic inspiration. Like anything else in music, the newness element fades and we are left with works that either still manage to speak to us, or, sometimes otherwise. To me Foss still sounds fresh and relevant, ever more so. For whatever reason I never encountered his four symphonies. Some of course were not yet written, and there may have been some obscure recordings available of the first several at the time but I never came across them when I was most actively combing through the classical record store stacks. 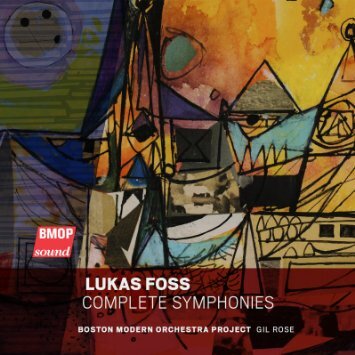 Fortunately and most happily the Boston Modern Orchestra Project, a fine organization devoted to resurrecting now unjustly neglected orchestral gems in the modern zone, has under Music Director Gil Rose taken care to provide us with excellent performances of all four Foss symphonies in the two-CD set Complete Symphonies (BMOP Sound 1043). The symphonies cover most of Foss's career, from 1944 through 1995, and were a platform where Lukas could synthesize, sum up and put into definitive form what stylistic universes he was either then traversing or was subjecting to retrospective attention. So we get the mysterious and atmospheric minimalism of "GEOD" refined, re-presented and integrated into a lush orchestral tapestry on his Symphony No. 4, "Window to the Past", or his own magnetically singular neo-classicist way in his 1944 Symphony No. 1. Each symphony is a milestone, as it turns out, in the overall body of Foss works. I am delighted to get to hear them in their full and detailed glory so wonderously realized by the Boston Modern Orchestra Project under Rose. I am sure this volume will turn more than a few heads while also reminding us dramatically how important a composer Lukas Foss was, how central he sounds today. It is with the heartiest recommendation that I present this set to you now. Anyone with an interest in 20th century modernism will gain I think great pleasure and insight by listening to this set. It is surely a candidate in my mind for the record of the year. Henri Dutilleux (1916-2013) is often enough presented as a modern-day impressionist, a successor to Debussy and Ravel. That is doubtless true in that his music has a luminousness and vivid color palette that has something in common with the orchestral brilliance of those composers. He also has some organic affinity at times with the music of Messiaen. But on the other hand Dutilleux's music has an idiosyncratic quality, a modern approach that puts him in his own space in fine ways. The volume at hand is an excellent example of this. It is a recent Seattle Symphony recording under Ludovic Morlot, presenting the works Metaboles, L'Arbre des Songes, Symphony No. 2 (Seattle Symphony Media SSM1007). 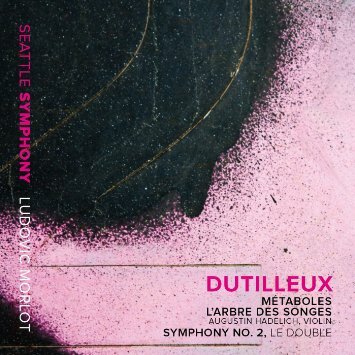 The Seattle Symphony aims to record all of Dutilleux's orchestral works, and this volume is a part of that. As it so happens it is an excellent place to start, as the three works are very fine examples and the orchestra excels under Morlot in bringing them very much to life. There is a continuity to be heard in the three works on the program despite having been written at contrasting points in time: "Metaboles" in 1964, "L'Arbre des Songes," a Violin Concerto, in 1985, and "Symphony No. 2 'Le Double'" in 1958. All three make excellent use of orchestration to bring out the shimmering quality of his constructions. The Seattle Symphony thrives in poetically realizing the full spectrum of sound colors inherent in the music, and the recording takes maximal advantage of the digital medium to give to us the detailed sound complexes in a gloriously full sound staging. "Metaboles" and the "Symphony No. 2" share a rather mysterious, atmospheric liveliness that remains modern at all times in its sophisticated melodic-harmonic demeanor, with a kind of narrative unfolding that may suggest all manner of associations to the listener without evoking anything literal. It is sonic poetry of great depth and subsequently great appeal. The concerted "L'Arbre des Songes" features an excellent performance by violinist Augustin Hadelich. As the later of the three works it shows a movement of Dutilleux's music from the profoundly sensual to the somewhat more concretely expressive, part of that stemming from the nature of the solo violin's role as Dutilleux conceived it. The orchestral passages remain vividly colorful. The rhythmic elements of the work are slightly more elaborately diffuse as violin and orchestra dialog with one another articulately. The violin's role is virtuostic and complexly declamatory in very musical ways, a showcase yes, but firmly tied to the musical vision of the composer. It is perhaps the most overtly "modern" of the three works at times, yet clearly partakes of the general thrust of the concerto form as it has evolved over the past century or so. In the end we are treated to state-of-the-art Dutilleux, performed with great care and sensitivity to all the orchestral nuances that mark the composer's special sound. It is a remarkable achievement. I surely look forward to the other volumes to come. In the meantime this one is ravishing, a stunner on all levels. 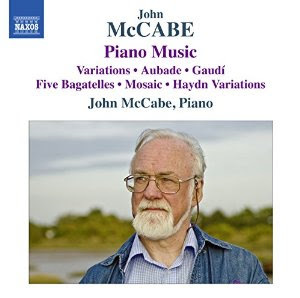 The late John McCabe (1939-2015), British composer, pianist and conductor, was a uniquely talented exponent of modern classical music, writer of some 250 works, belonging to no particular school but his own. I have covered several releases of his music on these pages (the search box above will bring you those) and now there is a third up for consideration, Piano Music (Naxos 8.571367), a collection of some six works written between 1963 and 1983, several in first recording (namely a good 40 minutes of later period works). The composer himself is at the piano. Not surprisingly he seems to have the inner track on the kind of periodic event clusters he favors, groupings that often take the form of variations. The flow of events have some similarity to Messiaen's classic period piano works, but only in terms of sequentiality more than actual content, the latter of which is most certainly original McCabe. There is a great deal of good music on the program, some 76 minutes worth. From the 1963 "Variations" to the 1983 "Haydn Variations" there is a progression and development to be heard, an increasing concentration of means and perhaps a certain increasingly brittle quality. The variations range so far afield that it is not a simple matter to keep track of how each event relates to an original theme. They seem to grow out of each other to the everyday ear, and of course the important point is to savor the musical inventions each as a piece of the larger picture, which emerges only slowly. A brevity and terseness is especially out front on the not specifically variations oriented works included here, the "Five Bagatelles" (1964), "Aubade" (1970), "Gaudi" (1970) and "Mosaic" (1980). There are times when the tonality becomes atonality or borders on it. Unusual approaches to rhythm are often the case. In the end we get a fascinating look at John McCabe thinking through his own modern approach to form and content on the pianoforte, using the instrument and his apparent love and understanding of the instrument to unveil structures that adhere within themselves more than they point outward to other musics. In that we get a singular set of piano pieces that sound like no others. It is perhaps a most fitting volume to contemplate the McCabe musical universe as we regret his recent passing. A strong volume that any modern classical enthusiast should find intriguing. Very recommended! One of the huge benefits of doing my music blogs is of course the chance to discover musical voices new to me and to pass that news along to my readers. In the past several years, Polish modernist Krzysztof Meyer (b. 1943) has been among the most important. His music is thoroughly crafted, inspired and inspiring. I do not know his symphonies as yet but his chamber music is essential listening. I covered earlier a volume of his complete string quartets that Naxos has put out and also a CD of his piano works. (Type "Meyer" in the search box above to see those reviews.) Encouraged by those happy encounters I turn to another one, the Piano Quartet, Piano Quintet (Naxos 8.573357) that just came out. The Silesian String Quartet and pianist Piotr Salajczyk team up for these two works and do so impressively. The music is by no means an easy thing to play but the performances are flawless and shaped nicely as spirited totalities. Meyer studied in his student days with Penderecki and Nadia Boulanger, and he has gone with their inspired advice to make something quite original of himself. The two works represented on this release have condensed intensity along the lines of later Bartok, Carter and beyond, rarified excursions into advanced form and overall musical momentum of great impact. 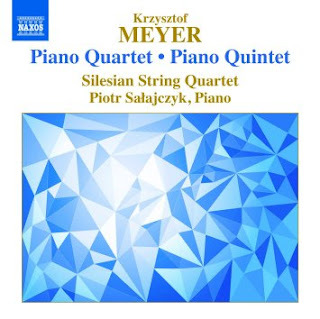 The "Piano Quartet" is from 2009 and enjoys its first recording here. The "Quintet" is from 1991 and requires a good 40 minutes to unfold in a sort of grand tradition. Both have a seriousness of purpose and a heroic sort of gestural sublimity. Whether utilizing dodecaphonic serial, aleatoric or other post-1945 composition techniques, Meyer seeks to realize a special personal vision with each of his works. As you hear the music you think less of the means by which each has been created, the ladders enabling Meyer to climb upwards into creative soundings, and more of the musical rooftops he has chosen to occupy. This is very much true of the Quartet and Quintet. I have now listened to this disk pretty intently five times, and each listen has given me increasing understanding and appreciation of what Meyer has set out to accomplish. The disk is essential listening for those who wish to experience high modernist chamber music in full originality, full flower. Meyer is important! Hear this music with concentration and you will be taken to very good places. Some collaborations seem in retrospect inevitable. But at the time of the inception there was nothing that somehow guaranteed it or assured that it would take place. That is so of the close association of composer Arvo Part and producer/label owner Manfred Eicher. Over 30 years ago Manfred had created a roster of jazz artists whose music had all in one way or another embodied a special ambiance and spaciousness that Eicher accentuated via his special sound-design productions. The result was the "ECM Sound" which was and remains extraordinarily influential as a style of music and a way of hearing it. At that point he was fortunate to hear for the first time the music of Arvo Part, the Estonian composer who created a special kind of music that reveled in the sensuous properties of tone, drawing in part on the way early vocal-instrumental music performed in cathedrals gave out a special aura, drawing also on the sonic particularities of some of the minimal composers then coming to the fore, but ultimately going his own way to create a body of works that transcended all of what had gone before while capturing essentials from centuries-old traditions in an entirely unique way. In point of truth perhaps Part's music struck an important resonating note with Eicher's own vision of musical sound and how one could capture and expand on it in the recorded medium. Needless to say, the two bonded immediately. A series of now some 14 or so releases have come about since the first Part-Eicher recording was released in 1984. It spawned Eicher's contemporary classical label ECM New Series and effected a sort of revolution of what new music could sound like, both from the composer's perspective and that of the producer-engineer-sound sculptor. Nothing has been quite the same since; there have been many subsequent composers and recordings (including other composers on the New Series label) that were inspired by Part and Eicher's vision. And so we after so many years are treated to a kind of Part/ECM retrospective that entails a special musical sequence created by Eicher to celebrate the many years of original first recordings made of Part's compositions thus far. The sequence tells via two CDs a kind of musical story that is both retrospectively exemplary in that it contains much excellent music by Part, a "best of" in some ways, but that in juxtaposing the sequence as Eicher conceived of it there is a heightening of the full scope of Part works as they contrast with one another. The result is Musica Selecta (ECM New Series 2454/55 2-CDs), a collection of some 19 works and/or movements from works that Part has recorded with Eicher over the years, first recordings that have been definitive but of course spawned versions by other performers that often enough have some quality that makes them equally interesting but never quite bettering these inaugural releases. Eicher via his sequence creates its own story line as it heightens contrasts between small (solo piano) and intimate works versus large and extraordinary full ones (choir and orchestra). Yet in the play of excellent performances there is continuity. The "small" ensembles hold in microcosm the attention to sensual and spiritual (for lack of a better word) tone painting that can be found writ large in the more massive ensemble works. Both take care to shift focus continually from the microscopic to the macroscopic in terms of sound staging and the use of vertical space, mass and the momentary but all-important silences between phrases. I won't run down a listing of the contents of the set here. 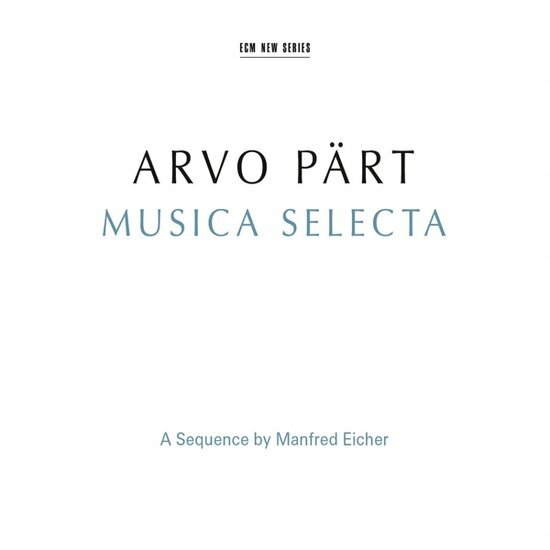 Suffice to say that it captures the full experience of Arvo Part, his music, and Manfred Eicher's meticulous sound-design productions of it all. Even those who like me have heard most all of it repeatedly get a fresh perspective on the music. That is what a retrospective if done well is supposed to do in the visual arts, and it is to be found in this audio collection as well. Needless to say it also forms an ideal introduction for those who for whatever reason do not know Part's music and have not the time nor perhaps the money to invest in the 14 albums that have come out. It is an experience of musical beauty that is in its own special way transformative. These are the works and the recordings that have gone a great distance in creating a unified body of music not quite post-modern, modern or pre-modern, but rather Partian, so to speak. In time, if we continue to keep our ears open, we hear much, ever more as the years roll by. Take as an example one Boris Tishchenko (1939-2010), Russian composer extraordinaire, and his Piano Sonatas No. 7 with bells & No. 8 (BIS 2189). 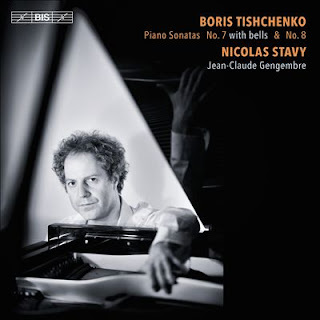 Nicolas Stavy has prepared for us considerably appropriate versions of these most original sonatas, with the help of Jean-Claude Gengembre on bells for No. 7. This is music of a modern Russian cast, essentially tonal and quirkily emerging out of time with some modernist spices and a very original way of unfolding, with its own kind of structural continuity and melodic-harmonic unpredictability. The part for bells (large bells, tubular bells and glockenspiel) in "Sonata No. 7" adds a good deal and does so with a kind of flair that Tishchenko exhibits in various ways throughout both sonatas. There is a hint of the sort of sarcasm and waywardness one can hear in the Russian modern tradition via especially Prokofiev and Shostakovich. (He studied with Shostakovich.) Yet there is an identity thoroughly Tishchenko-ist notwithstanding. He uses tradition in many ways, only to subvert it to his own ends. The eleven sonatas written over the full course of Tischenko's career are apparently central to his output. Certainly the seventh and eighth reveal a brilliant musical mind and an engagingly idiomatic sense of pianism at work. Where the seventh has sometimes great dash, the eighth has a puckish sense of form and tradition unbound and rebound according to Tishchenko's vision. A grotesque can-can makes a mischievous appearance, willfully, out of more "serious" passage work, for example. This is an excellent example of the post- element. What goes with what is a matter for a personal aesthetic and the needs of Tishchenko's fertile imagination. We get some very fascinating modern music with these two sonatas, played with great sympathy, attention to detail and a good deal of heart by Nicolas Stavy. If you are a dedicated follower of pianoforte expression in our time, this will give you much joy and substance to experience. Tishchenko is a present-day original, a musical titan as it were, determined to carve out his own path. The album is essential and leaves me wanting to hear more, much more. Molto bravo! 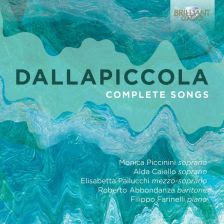 Dallapiccola, Complete Songs, Monica Piccinini, Filippo Farinelli, etc. Luigi Dallapiccola (1904-1975) was arguably the most important Italian composer of the post-Schoenberg generation. If his music is perhaps not as widely performed as it was in his heyday, it is not due to a lack of merit. We can hear that readily in the new two-CD set Complete Songs (Brilliant 95202). As with the Busoni set yesterday, we get everything he composed, in this case for voice and piano, nicely performed by Monica Piccinini, Alda Caiello, sopranos, Elisabeta Pallucchi, mezzo-soprano, Roberto Abbondanza, baritone, and Filippo Farinelli at the piano. All give us excellent performances. The repertoire here consists of the more-or-less expected and the unexpected, mostly the latter. The two volumes of "Italian Songs of the 17th and 18th Centuries" from 1961 take up the bulk of the program. They feature Dallapiccola's realizations of the figured bass and editing. Included are gems from Alessandro Scarlatti, Monteverdi, and others rather well-known or somewhat obscure. The music sounds a bit more homophonic than contrapuntal, which may have something to do with Dallapiccola's arranging-editing. The music is well-played and well-sung. It is all rather delightful. The remaining two works come from Dallapiccola's first modernist period, from 1946 and 1948, . They are beautiful, somewhat early examples of his original explorations in the dodecaphonic, 12-tone style then so current. Both "Rencesvals, trois fragments de 'La Chanson de Roland'" (1946) and the "Quattro liriche di Antonio Machado" (1948) give us a rather brief but prime look at Dallapiccola in this period. He would write a great deal of vocal music but of songs these are the only two, other than several student works that he later renounced. Even with all that the two-volume set gives you much to savor. The "Italian Songs" are of course quite untypical of the composer but delightful nonetheless. The two song cycles that typify Dallapiccola are essential fare. It is so well done that you find yourself relaxing and simply enjoying it all. Bravo. The Brilliant price and the quality of the performances make it a most worthwhile set. When I think of wonderful music for clarinet in a chamber context, my mind goes to Mozart, Schubert (in a lieder arrangement), Brahms . . . and then I skip ahead to Hindemith. 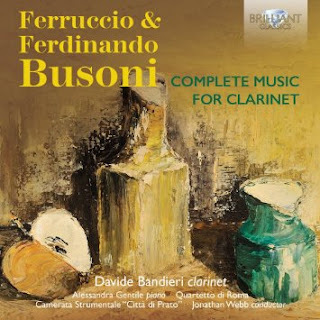 Now that there is a very nice recording of Ferruccio (& Ferdinando) Busoni's Complete Music for Clarinet (Brilliant 2-CD 94978) I have something really good to fill that gap from the late 19th-early 20th century. It turns out that Ferruccio Busoni (1866-1924) wrote a good deal of excellent music for the instrument. There are even two additional short pieces by his father Ferdinando, who was himself an acclaimed clarinetist as well as composer. We get all of it on the Brilliant set, played quite nicely by Davide Bandieri. In all there are 13 works represented, many for clarinet and piano, a few for clarinet and string quartet, and the "Concertino Op. 48" for clarinet and small orchestra. The music is invariably rich and inventive with a genuine feel for the various clarinet registers and their special qualities. It is music of a substantial sort, not especially modernistic but neo-classicist as much as late romantic. It is music to entrance. Davide Bandieri triumphs in his role and his chamber cohorts sound well. The quality of the recording leaves nothing to be desired. I knew nothing of this music until now. I must say I am impressed with it. It holds its own and gives us a side of Busoni that is very welcome, especially to anyone who loves the clarinet in a chamber context. The Brilliant releases are often enough exceptional and they are at a nice price. This one has much music and it is uniformly excellent. So get it if you like the idea of it! You will likely not be disappointed. Over the years certain compositions by Manuel de Falla (1876-1946) have become important to me. His "Nights in the Gardens of Spain" for piano and orchestra, "The Three Cornered Hat," his "Harpsichord Concerto" and his chamber-vocal work "Psyche" all have gotten my ear and become a part of what I regularly listen to and appreciate. When I came across his newly released Complete Piano Music by Juan Carlos Rodriguez (Paladino 0062) I knew I had to hear it. All his solo piano music fits on a single CD? Yes, apparently. Maestro Rodriguez does a wonderful service with his beautifully idiomatic renditions. As you listen you are reminded that de Falla certainly fits in with Granados and Albeniz, Wikipedia tells us, as THE central Spanish composers of the first half of the 20th century. I can't dispute that. But hearing these solo piano works also gives you an entrance into his music on the most intimate levels, in that way like the piano music of Granados and Albeniz. All three combined Spanish folk strains with lively impressionistic modernisms and a hint of late romanticism, too. And each in his own extraordinary way. In all the disk contains 13 works, one in four parts. As I've listened over the last week, I found myself very much taken by the music, and wondered why I have not been exposed to it all before? The intersections of self and music are subject to all kinds of nearly accidental meetings. I never came across the piano music for reasons I do not know. But it is all so good, so much de Falla-esque, melodically immediate, so Spanish, so pianistic, I am very happy to make its acquaintance finally. And very happy too that I am introduced to it by pianist Juan Carlos Rodriguez, who seems the perfectly right exponent, very interpretive, very appropriate, very spirited, very much filled with the joy of the music. I won't run down the program listing. It is complete and what that is has so much good to it that there is nothing superfluous. 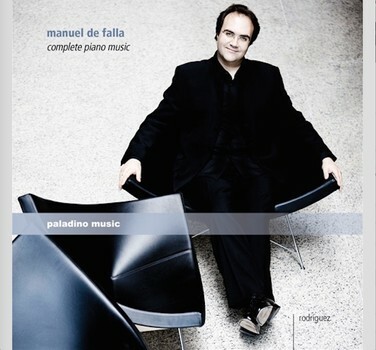 De Falla may not have written a great deal of piano music but each seems like a gem to me. A big surprise comes toward the end of the program, where de Falla gives us his complete reharmonization of "The Volga Boat Song." It's rather amazing! And so I heartily recommend this volume to you. I will treasure it! You may well do the same. Through the recorded medium we have valuable documentation of the greatest opera singers of the 20th and now 21st centuries. In my listening habits I initially concentrated on the operas themselves. In the '70s I began exploring the great vocalists. Callas, Gigli, Ferrier, Godunov are favorites, not surprisingly. And then there is a new generation of vocalists, two of whom combine forces on a recent album. I speak of Dinara Alieva and Aleksandrs Antonenko, Azerbaijani soprano and Latvian tenor, respectively, in a program of arias and duets by Verdi-Puccini-Tchaikovsky (Delos 3477). The singers are accompanied nicely by the Kaunas City Symphony Orchestra and Choir, conducted by Constantine Orbelian. The repertoire should be familiar to all, with excerpts from Verdi's Aida and Il Trovatore, Puccini's Tosca and Tchaikovsky's Queen of Spades. Both Alieva and Antonenko are formidable exponents, dramatic, ravishingly dynamic, vocally extraordinary, some of the best of our day. I especially like their Tchaikovsky, perhaps because I have not heard as many versions of the arias from Queen of Spades, but also because they seem particularly exceptional in bringing out the color and thrust of the music here. In any case I am impressed with both. These are world-class artists of the first rank. The disk tells us that clearly and unequivocally, impressively and very enjoyably. If you seek some fresh talent in your operatic journeys, look no further. Very recommened. Song Cycles, Composers Concordance, Pritsker, etc. Modern classical contemporary song cycles are perhaps among the least integrated forms within the received general culture out there. That's so as compared with the symphony, or even some forms of chamber music, solo piano coming to mind. Or at least that's my impression. Song cycles remain more or less firmly a part of the "high culture/low culture" dichotomy, as part of the former, though there's no inherent reason why they should be considered "elitist" in any set way. Anyone with a musical ear can appreciate them, I think, at least the good ones. Composers Concordance, both a label and an institution, has taken an iconoclastic stance on the high-low division. Their new anthology Song Cycles (Composers Concordance 0029), contains some of those good song cycles, and for all that does not overtly set out to break down the division in this case, but along the way does not advocate either a "purist" or an "elitist" stance on the matter either, instead giving us music written in the present tense, incorporating whatever high-low elements that seem needed for a particular cycle. So for example Gene Pritsker's four-movement "Music from an Airport Bar" brings in blues-jazz elements both lyrically and musically. Is that a "low" element? No, of course not, but on the other hand it still seems meaningless when you take account of the whole of that cycle and how it comes across, which is convincingly. Like Gene's recent opera. There are six cycles included in the anthology, with "Carefully Try Balance" broken into three parts, each taken by a different composer: David Gotay, Zach Seely, and Thomas Carlo Bo, respectively. The rest of the cycles have a single composer each, Pritsker as mentioned but also Patrick Hardish, Luis Andrei Cobo, Eleanor Cory, and Lester Trimble. All are contemporary-modern sounding without being in any way formulaic. All of course feature a singer, sopranos for the most part, but also a tenor-baritone (for the Pritzker cycle). A piano accompaniment is central to four of the cycles; "Carefully Try Balance" adds a flute part; Lester Trimble's "Four Fragments from the Canterbury Tales" uses flute, clarinet and harpsichord as instrumental accompaniment (the Circadia Ensemble). The vocal parts are generally quite well sung, though on occasion the use and width of the vibrato for the soprano seems like it could be lessened productively. At any rate these are song cycles that withstand close, repeated listening and hold together as significant and pleasurable compositions. It may not be the record of the year but it holds a worthy treasure of new music from the Composers Concordance group. Anyone with a penchant for post-romantic song cycles with find this a welcome addition. It undoubtedly captures a moment in what is happening on the US scene, and does it memorably. If you don't know composer Luys Milan (c. 1500-c. 1561), don't worry, you are not alone. 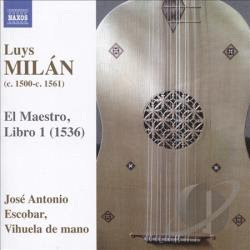 He composed a series of works for the vihuela, a sort of lute-guitar hybrid (see image on cover above). His El Maestro is the earliest known publication of such works, printed in Valencia in 1536. He was associated with the court in Valencia as a vihuelist charged with "entertaining the ladies" (liner notes) there, not as an employee so much as a court nobleman. Not a great deal else is known for sure about him. The music speaks volumes, however. Jose Antonio Escobar gives us some lovely performances of the music, specifically the El Maestro, Libro I (1536) (Naxos 8.573305). The vihuela sounds wonderful, lute-guitar like, with its (I believe) 11 strings, and Milan's music is well constructed and melodically vibrant, bringing out the instrument's special sound quite vividly. As the liner notes suggest, there is sometimes the impression of imitative counterpoint in the music, but not in any strict sense. Nonetheless the two-part writing has considerable charm. Maestro Escobar does a very fine job with the music and the CD has pristine clarity of sound and presence. Anyone who has an interest in early music for lute-guitar will find this very engaging, as will those who wish to delve further into the Spanish Renaissance. But really it is music anyone who wants a little something different will enjoy. 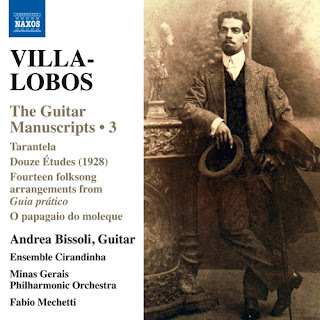 Villa-Lobos, The Guitar Manuscripts 3, Masterpieces and Lost Works, Andrea Bissoli, etc. The long and very productive composing career of Heitor Villa-Lobos (1887-1959) included some of the finest music for guitar written in the last century. Yet there was a fair amount of it that has fallen into obscurity for various reasons. The Guitar Manuscripts series on Naxos addresses some of that, with Andrea Bissoli taking the solo guitar role, supplemented with others as called for. We now find that The Guitar Manuscripts 3 (Naxos 8.573117) is out. It continues where the first two volumes left off (see my reviews of Vols 1 & 2 on these pages), with four works/sets of compositions, all most certainly of interest. The major contribution is the original 1928 versions of his "Etudes," then in 12 parts, that he wrote for Segovia. The final version was only published in 1953 and had been reworked somewhat, with changes, cuts and additions. This first version is fascinating to hear, as played by Bissoli on a 1917 Manuel Ramirez guitar, very similar to the 1912 Ramirez guitar Segovia was using when he and Villa-Lobos first met in 1924. Opening the program is the brief but invigorating "Tarentella" (1911) which survived as a piano work but is here reconstructed by Bissoli in its hypothetical, original guitar version, convincingly so. Villa-Lobos's "Guia pratico" was a series of short songs composed when Villa-Lobos was superintendent of music in Rio, 1932. The songs were intended for performance by schoolchildren, using various instrumentation depending on the resources at hand. Bissoli arranges fourteen of them for guitar and chamber ensemble. They are in first recording here (as is the guitar version of the "Tarentella), and are most certainly quite charming. The final work is the 15-minute orchestral "O papagaio do moleque" from 1932. It is whimsical and a good bit of fun, yet also very much in the realm of Villa-Lobos as a brilliantly original orchestral stylist in his day, giving us a fitting close to a very pleasing program. Not all of this music is monumental. But all is rather delightful. Anyone with a liking or even just a curiosity about Villa-Lobos in his early- to mid-period will find this a very enjoyable go-round. Bissoli gives us finely nuanced guitar renditions that all who dwell in the land of six strings will appreciate, too. Mieczyslaw (aka Moissei) Weinberg (1919-1996) was not always in good graces with the powers that be over the many years he lived in Russia under the Soviet regime. This is not the place to go into the vicissitudes and dynamics of that relationship. Nonetheless there were a number of Melodiya LP releases of his music during his lifetime. Some of that is now generally available worldwide as a CD: the Cello-Violin-Flute Concertos collection (Melodiya MEL CD 10 02315). Recorded between 1961 and 1968, it features excellent performances by Mstislav Rostropovich on cello, Leonid Kogan on violin, and Alexander Korneyev on flute, respectively, in the solo roles. The orchestral performances are not precisely perfect, but do show great spirit. 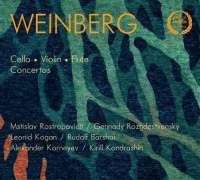 The concertos are excellent Weinberg: "Concerto for Cello and Orchestra, op. 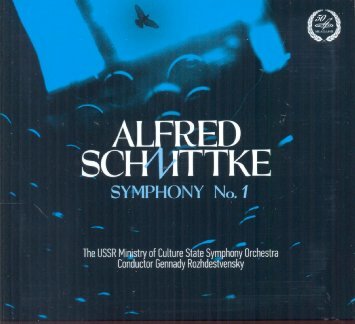 43" (1948) with the USSR State Symphony under Rozhdestvensky, the "Concerto for Violin and Orchestra, op. 67" (1959) with the Moscow Philharmonic under Kondrashin, and the "Concerto for Flute and Strings, op. 75" (1961) with the same orchestra under Barshai. The soloists were of course some of Russia's very best; the recordings give us three masterful interpretations and very lively orchestral accompaniment. All three works show Weinberg in fine form, brilliant. The historical importance of these recordings make them invaluable and the performances themselves give us much to appreciate. They may not be perfectly definitive in their totality, but the solo parts get a glorious treatment. They are seemingly essential, then, for any Weinberg enthusiast, and anyone who wishes to know more about Russian musical modernism in the mid-20th century. The prospects of a modern classical solo percussion recital DVD is one that appeals to this writer. After all, I studied classical percussion and have followed the music with interest for a long time. 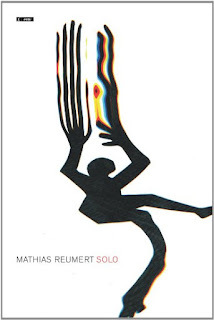 So when percussion adept Mathias Reumert and his video DVD Solo (Metier) became available recently, I made sure to get a copy for review. It is a wide-ranging recital showing Reumert as a masterful exponent, someone with impressive technique and poetic interpretive skills, and a real dramatic, theatrical flair. All of this is very much a part of the works performed, in varying degrees according to the needs of each piece. One first notices the excellent quality of the sound and the very musically sensitive video direction of Christian Holten Bonke. The choice of camera angles and cuts follows the music intelligently, and the works that call for special animated aspects and/or strong general visual components work especially well here. We see this in the body percussion/theater work "?Corporel" by Vinko Globokar--as Reumert makes unusual percussive and expressive gestures showing a thorough command of the requirements of the work. The video representation of what is intended joins with the performance for something quite engaging. There are nicely composed solo vibraphone and marimba works by Hans Werner Henze and Franco Donatoni that are played with true artistry. The opening work "Time & Money" by Pierre Jodlowski has an extraordinary choreographed gestural dimension as well as difficult virtuoso drum set passages synchronized with electronics--all of which are executed with great skill and a theatrical presence. Some of the high points are the two works by Xenakis, "Psappha" and "Rebonds," both with demanding multi-drum, multi-percussion solo parts that Reumert handles with great fluidity and musical logic. Ferneyhough's "Bone Alphabet" makes similar demands and is visually stimulating in its precision correlation of percussive parts and lighting effects. In the end the video-DVD-high quality sound medium broadens the appreciation of the visual components of each work and the physicality of playing it, the theatrical elements, and the impressive virtuosity and artistry of Reumert. Anyone interested in the possibilities of avant modern solo percussion will find this a fascinating and very provocative, even exciting recital. Reumert is extraordinary! Highly recommended. 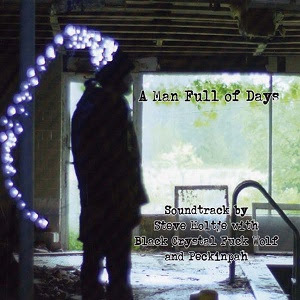 What we have at hand today is the soundtrack of the film A Man Full of Days (MechaBenzaiten MB 15). It features primarily the music of Steve Holtje. In full disclosure I count Steve as a friend and associate, mostly though our ongoing dialog on the internet and in the course of his tenure managing ESP records. But that is a separate matter from his music, which I would not be posting on did I not find it very interesting and engaging. The 15 compositions of Holtje are supplemented by two from Black Crystal F_ck Wolf, one by Bruce McKenzie (Peckinpah) and a brief 1930 orchestral work by Levko Revutsky and Vyacheslav Ovchinnikow. The additional pieces do not disrupt the mood of Holtje's music, but serve to enhance it. Steve has a definite penchant for the atmospherically ambient. There are a number of electroacoustic movements that set a powerfully inner-directed mood and have nicely realized sound color-texture traits. There are solo piano works that add onto Satie's "Gymnopedies" in good ways; there are also pieces that utilize some aetherial organ sounds and one that includes a women's chorus. Through it all we have some extraordinarily interesting modern/post-modern mood-tone poetry. Holtje proves to be an especially effective sound sculptor in these movement-works. I found myself increasingly gravitating towards the music as I listened more and more. On the basis of this soundtrack album I do find Steve Holtje to be a composer to watch. This is a very nice introduction to his music and I certainly hope there will be more for us to appreciate in the years to come. He has an adventurous yet also a very engaging way. The premiere recording of Alfred Schnittke's Symphony No. 1 (Melodiya CD 10 02321) by the USSR Ministry of Culture State Symphony Orchestra under conductor Gennady Rozhdestvensky in 1987 was a signal event in evolving glastnost policy as well as a triumph in Russian late-modernism. The recent Melodiya CD reissue has just become available here and it is a remarkable album. The Symphony is a rather titanic work, filled with dense modern clashes and collages of many different musical strains, from baroque to free jazz, from marches to the blues, all interspersed within a linear fire-breathing avant orchestral setting. In the original liners reproduced for the CD edition Schnittke called what he was doing "polystylistics" and noted his debt to pioneering composers like Ives and Mahler. No doubt the singular Schittke First was and is a landmark venture into a postmodern landscape, albeit a kind of continuation and extension of collage style. Schnittke was most certainly at this phase of his career one of the most important exponents of the new cacophony, the "impure" form of modernism of the last years of the 20th century. This is a extremely important and also extremely engaging work that gives us a window onto the era as seen by a brilliant musical mind. I missed the original LP issue at the time. It was not widely distributed in the States but I soon heard of the composer and ultimately began exploring his music in some depth based on what became available to me. This recording marked a real turning point for the composer. He envisioned it as a kind of chronology of the 20th century in musical terms. There are aleatoric elements and huge expanses of orchestral sound that require a very large symphony orchestra, which subsequently produces some of the most remarkable sonic spectacular fireworks you are likely to hear from such an outfit. A good deal of preparation no doubt was required to get it all right. The performance has nothing of the slapdash to it, though there are extraordinarily chaotic qualities to parts of the work. Rozhdestvensky manages to convey the excitement and turbulence of the music while parsing out each sound event section with some care and attention to the overarching whole. There is at least one later recording available according to Amazon. I have not heard any but this one. The historic and artistic importance of the Melodiya recording makes it essential, surely. It is indispensable Schnittke and a breakthrough postmodern work that should be studied and appreciated by anyone committed to understanding late modernity in the orchestral sphere. It is also a breathtaking work in definitive performance! If you want to know how we got to where we are today, this belongs in your library. Spain's most distinguished high-modernist? That likely is Leonardo Balada (b. 1933). Naxos has been releasing a number of fine volumes devoted to his music (look his name up on the search box above for more reviews), the latest of which is Concerto for Piano, Winds and Percussion (Naxos 8.573064). It pairs the Carnegie Mellon Wind Ensemble under various conductors with Enrique Graf, piano, David Premo, cello, and Ashan Pillai, viola, for the concerted numbers. 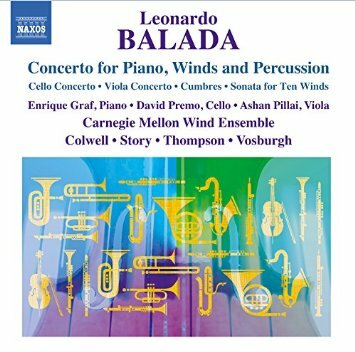 Balada's output is divided between a first, neo-classical period, characterized by the "Concerto for Cello and Nine Players" (1962, rev. 1967) included here, and his later high-modernist phase, which is represented nicely by four works on this volume, composed between 1971 and 2009-10. He came to the US years ago, where he graduated from Columbia after studying with Persichetti and Copland. He has been a professor of composition at the Carnegie Mellon University in Pittsburgh since 1970. The Carnegie Mellon Wind Ensemble is a first-rate ensemble and seems ideally suited to perform the various compositions on this album. 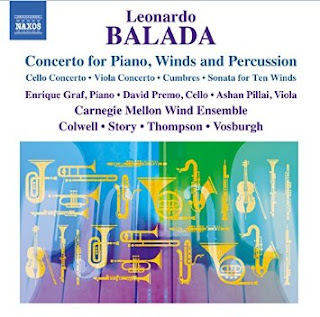 We get to hear an excellent assortment of works by Balada: "Combres--A Short Symphony for Band" (1971), the "Concerto for Piano, Winds and Percussion" (1973), the aforementioned "Concerto for Cello and Nine Players" (1963), a first recording of his "Viola Concerto" (2009-10) and his "Sonata for Ten Winds" (1979). All are central Balada, showing master craftsmanship and inspiration, a modernist and neo-classic tang, and a contrapuntal complexity that does not so much remind of later Stravinsky as much as parallels him as an equally original voice in the modern lineage. The music can be ascerbic, it can be stirring; it is consistently dramatic and expressive; it is always substantial. It forms an excellent introduction to Balada for those not familiar, and also gives those that do a wealth of excellent music to savor. The performances are exemplary as well. In the lineage of today's music, at least in the ambient, radical tonality, sound color realm of works, one might trace a movement from Satie to Morton Feldman to now as one line. 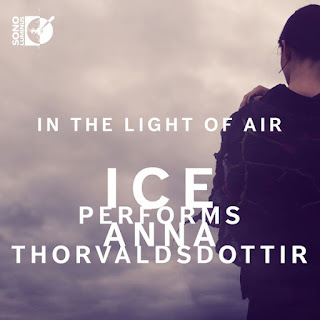 That seems very much so to me in the music of Icelandic composer Anna Thorvaldsdottir, specifically her In the Light of Air (Sono Luminus 92192) as performed by ICE. The program consists of one longer and one shorter piece, the title track being the former, "Transitions" the latter. The two flow together seamlessly in a sustained mood that begins as a hushed carpet of sounds with emerging motival elements that increasingly come to the forefront as from a mist, only to recede again. The instrumentation is electronics, viola, cello, harp, piano and percussion, including an installation of metallic ornaments that appear dramatically and percussively in the final "Remembrance" movement of the first work. "Transitions" was written for the cellist in the ICE ensemble, Michael Nicolas, who alternately personifies "man" and "machine" in the piece, expression and emotion versus maximum precision and accuracy. ICE, which stands for the International Contemporary Ensemble, is a collective of some 35 musicians, capable of morphing from the smallest chamber ensemble to a rather large chamber orchestra depending upon need. The quintet assembled for In the Light of Air sounds absolutely perfect for the music at hand, which makes sense in that both works were created with them in mind. That music has considerable magic. There is a sort of sustained ritual tonal wash to the first piece with emerging instrumental segments that stand out as having a discursive logic in the overall scheme and great memorability. The "man and machine" oscillations of "Transitions" embody contrast and color in different ways, displaying the possibilities in a solo cello context, so that there is a sort of inter-resonating totality to it all, a definite stylistic congruity that is strikingly original. Anna Thorvaldsdottir has given us considerable beauty and great depth in this program. She is a special creative force and one most definitely to watch in the contemporary music world going forward. As is mostly the case in Sono Luminus releases, the music is on two disks, a standard CD with conventional two-channel playback, and a blueray capable of 5:1 surround sound.